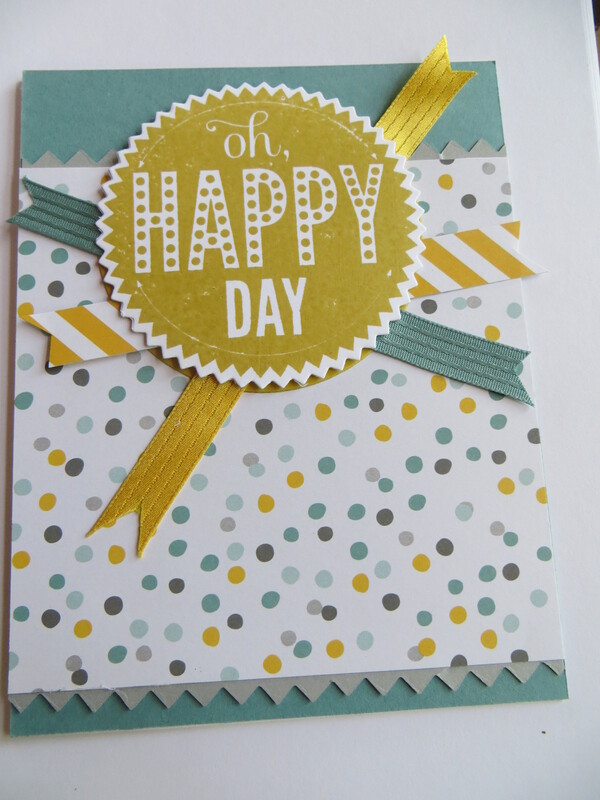 Today I am featuring another card featuring using the yummy Stampin Up Moonlight DSP paper stack #133701. I can’t help myself because I love this stack and especially love the Hello Honey new in color. I really think it goes with all the new in colors and most of Stampin Ups colors. I textured the background with my new favorite textured impressions embossing folder, Large Polka Dot #133739 because I love love love polka dots! I added a strip of the polka dot Moonlight DSP and finished the card with a bow cut from Lost Lagoon cardstock using the Gift Bow die #129977. For the center of the bow, I added a flower from the Itty Bitty Accents Punch Pack #133787. When the new 2014-2015 Stampin Up annual catalog debuted in June, the first things I ordered were the fabulous Beautiful Bunch #134282 stamp set and the coordinating Fun Flower punch #133785. 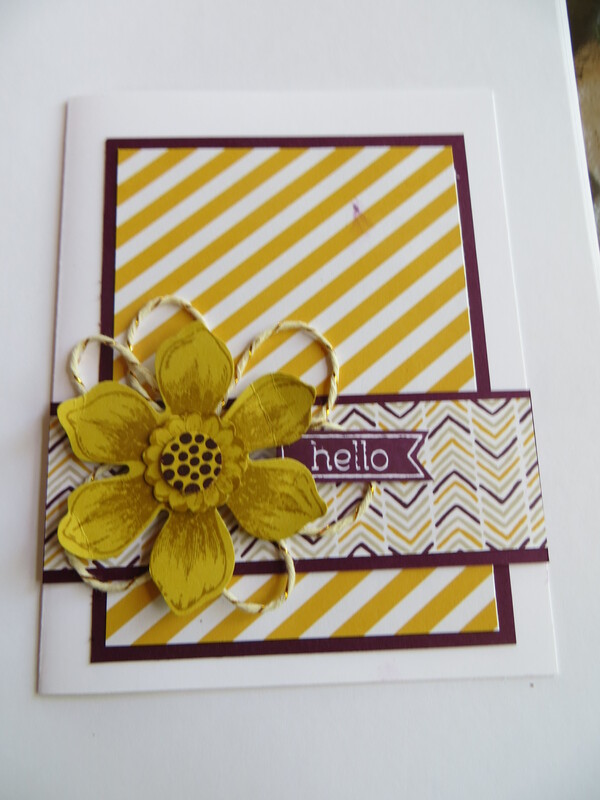 I also fell in love with the Moonlight DSP paper stack #133701 and made today’s card with my new stuff. I think the Hello Honey and Blackberry Bliss rock when used together! Behind the punched flower I added a flower shaped with the Gold Metallic Bakers Twine #132975. Love the look! I am still recovering from prepping for my Christmas in July workshop so I needed to come up with a quick and easy card. Today’s card uses the Stampin Up Moonlight DSP paper stack #133701 for the background paper. I then stamped the Starburst Sayings #133185 stamp set and the coordinating Starburst Framelits #132967 for the focal piece. I added scraps of the new 3/8 ” stitched satin ribbon in hello honey and lost lagoon and a piece of scrap moonlight DSP. In the Stampin Up annual catalog, the Starburst Sayings and the Starburst Framelits are a bundle and save item. When purchased together as a single item number (wood #134817 & clear #134818) you can save 15% so go ahead and have a happy day! Your eyes are not deceiving you. 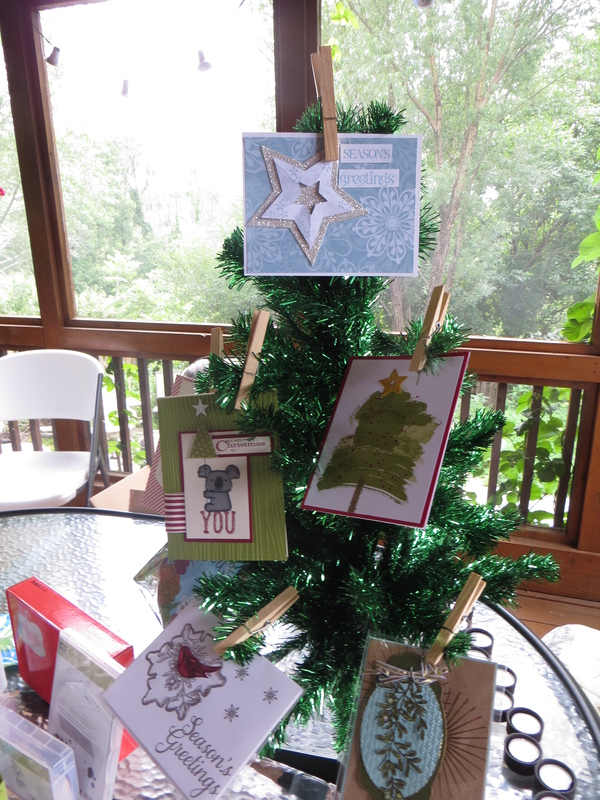 That is a Christmas tree that I had set up for my recent and most successful Christmas in July workshop. 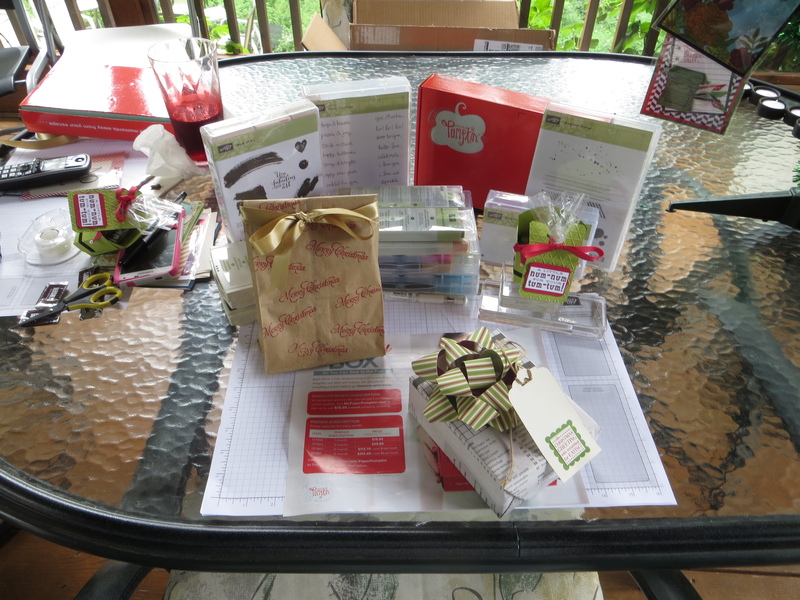 My customers love and look forward to the Christmas in July workshop and I decided this year to use what I had on hand since Stampin Up’s annual catalog has a limited offering of Christmas stamps and other stuff and the new Stampin Up holiday catalog is not available yet so that makes it hard to have a Christmas in July workshop. I had a fun time looking beyond the stamp or framelit and create a card that was not intended for the stamp. 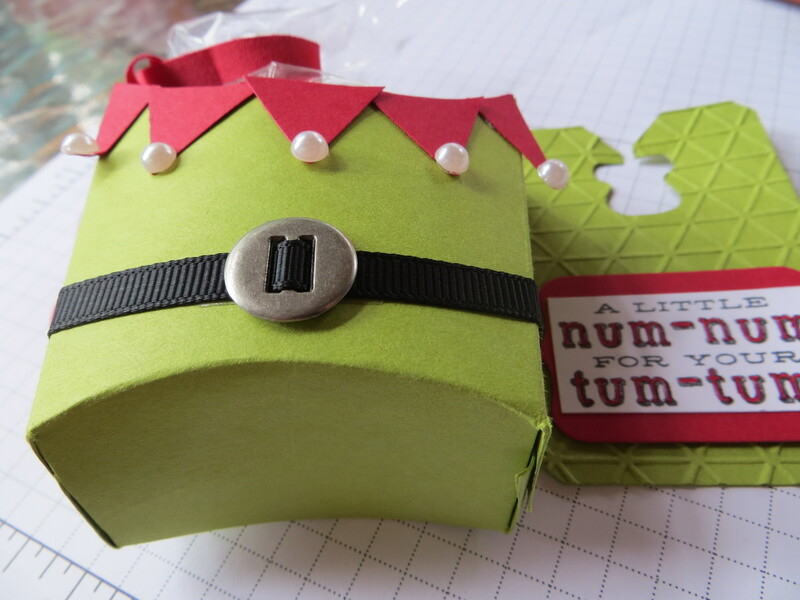 Plus Cammie helped out and sent me kits from her successful Christmas in July workshop and the cutest Elf treat box from the all new Fry Box XL die #132966. Cammie’s Christmas cards were posted a few days ago and mine will post soon. So today I am show the details of what each guest got for attending this workshop. 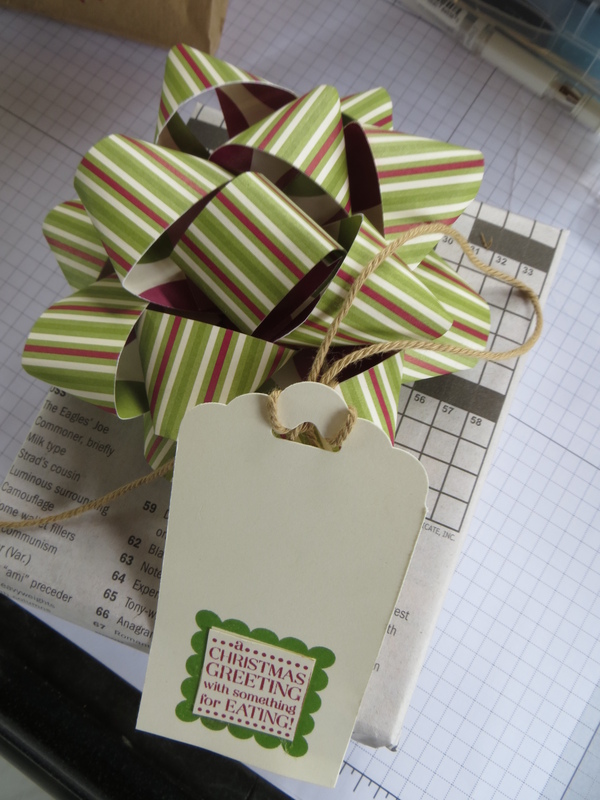 Each guest got a white elephant stamp set wrapped in the comic section of the news paper and I made a hand made bow from retired Stampin Up DSP, a brown paper bag with all their workshop items inside. 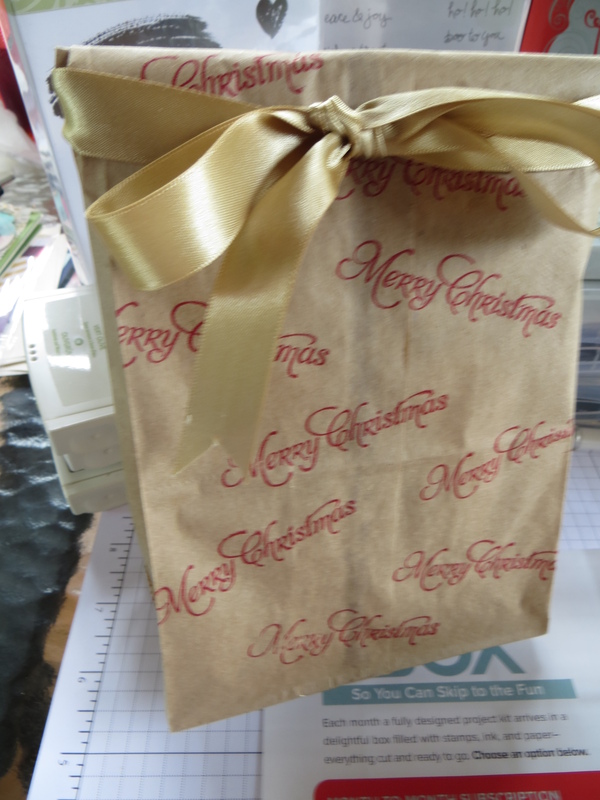 The brown paper bag was stamped with a Christmas greeting and tied with a piece of the 5/8″ Gold Satin Ribbon #134547. 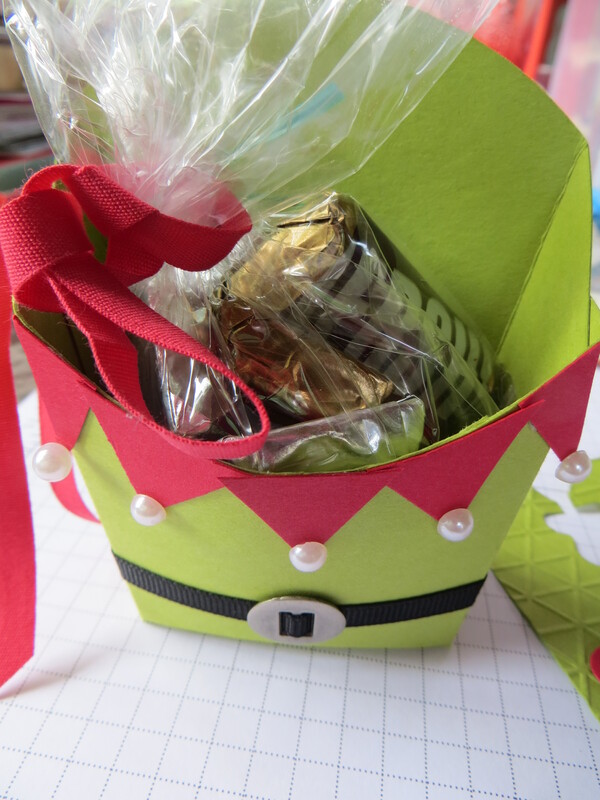 Each guest also got a bonus Paper Pumpkin card to make and the cutest elf treat container filled with chocolate. It was a lot of work to get ready but it was a fun event. I needed a quick thank you card and my goal was to find an unused stamp set and use it so today’s card is it. I bought the Blooming with Kindness #126422 stampset a long while ago and never used it. So I used the big blossom and stamped it in 3 different inks, added a sentiment and a coordinating ribbon and card was complete. Love the quick and easy cards! Today’s card is a quick card using old retired products. The card could easily be reproduced by using updated and current supplies. 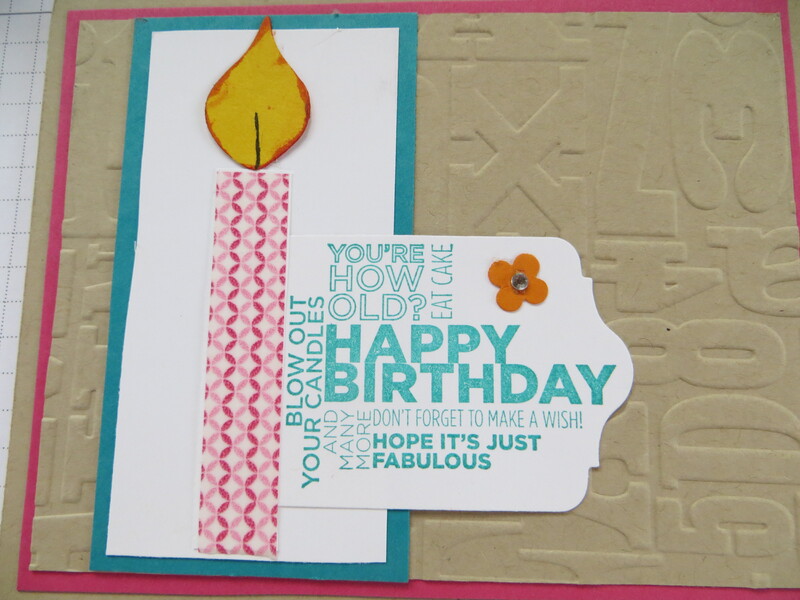 I used Washi tape to make the candle and the flame is made with the wing from the Bird Builder punch #117191. I added a sentiment using a now retired set called Bring on the Cake. 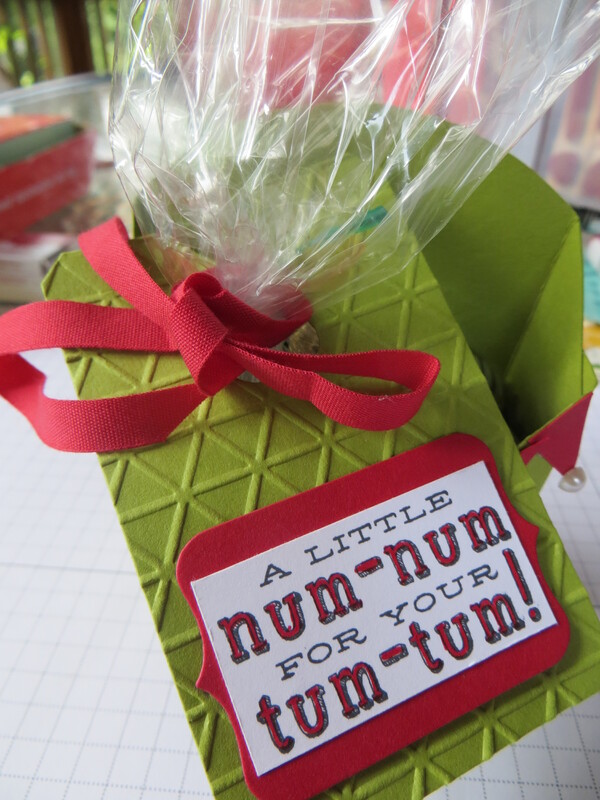 In July we traditionally host a Christmas in July workshop where our focus is Christmas cards. Today marks only 5 months until Christmas so I am sharing a parade of Cammie’s cards from her Christmas in July workshop. 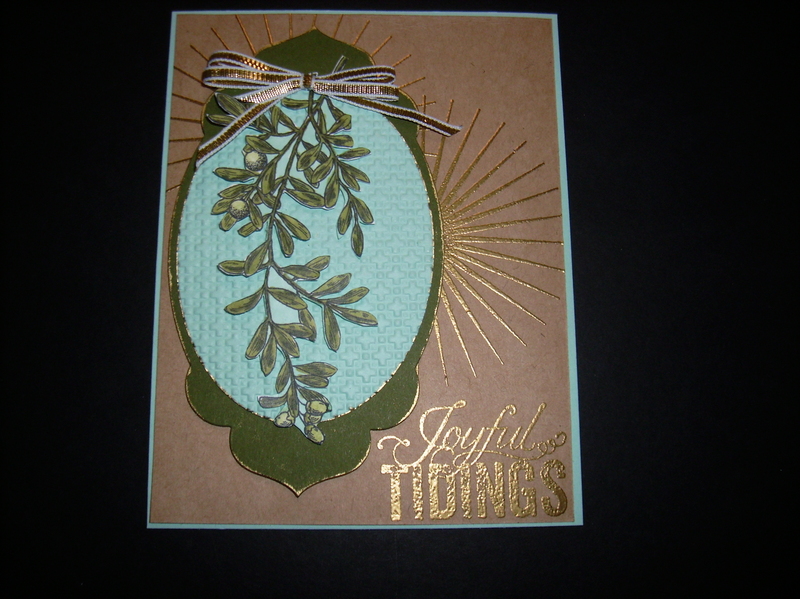 The first card is the Joyful Tidings card and features the Kinda Eclectic #135347, An Open Heart #134999, and Christmas Messages #131790 Stampin Up stampsets. The starburst from the Kinda Eclectic set and The Joyful Tidings sentiment from the Christmas messages set are embossed with gold embossing powder. The largest Apothecary Accents framelit #127003 and the Oval Accents framelits are layered to and anchor the mistletoe stamped, colored with Old Olive #130999 and Coastal Cabana #129369 blendabilites markers and then handcut. The mistletoe was tied with the scrumptious gold 1/8 ” ribbon. 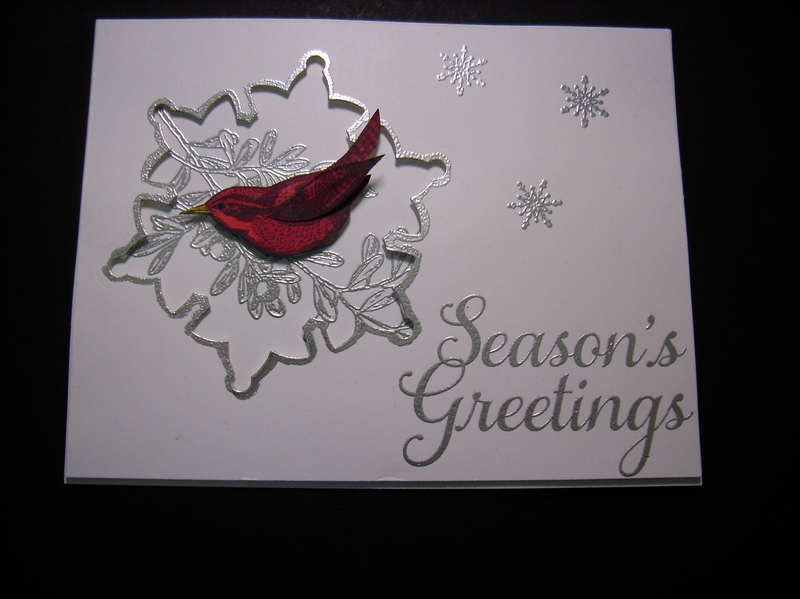 The 2nd card in Cammie’s suite of Christmas cards is the silver Season’s Greetings card. This card has a window cut from the Snowflake Framelits (no longer available) and then Cammie used silver embossing powder to emboss the mistletoe from the Open Heart stamp set. The bird is also from the Open Heart stamp set and was colored using the Pumpkin Pie #130997 and Cherry Cobbler #130995 Stampin Up blendabilites markers. Once colored the bird was hand cut out and perched atop of the silver mistletoe. The silver embossed snowflakes are from the Snow days #131892 stampset and the sentiment is from the Joy to the World stampset #131796. The simplicity of this card makes it a beautiful and stunning card. The final card in Cammie’s Christmas card parade features the Tap, Tap, Tap #134201 from the Stampin Up annual catalog. The Back to Black DSP #133700 is the background of this card. Cammie went back to the basic to create the note paper using a ruler and the Project Life journaling pens #135304 and used the spiral border punch #119874. Cammie added a typewriter using the Tap Tap Tap stamp set. 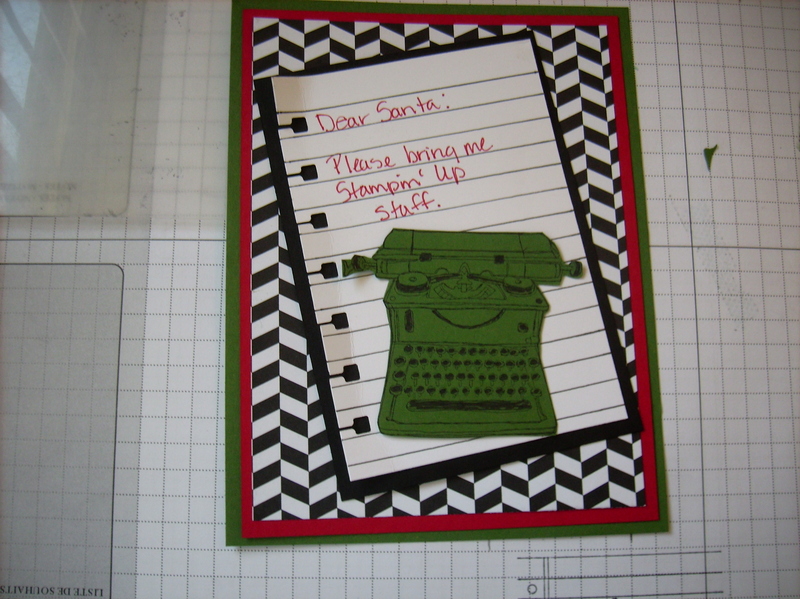 She completed the card by writing a Dear Santa letter asking for Stampin Up supplies!